All these events are open to the public. Rogue Kitchen & Bar: 601 W Cordova St. Hang out with the ConFoo attendees, speakers and organizers. Enjoy craft beer, food and a pleasant atmosphere. Sponsorship available! During the Innovation Night, local entrepreneurs will present awesome products that they're building. Sponsorship available! 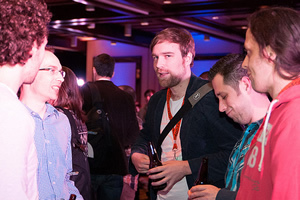 Right after the InnovationNight, the Happy Hour will allow you to have a drink and network with ConFoo attendees, speakers and sponsors. Sponsorship available! Join us for a cocktail right after the presentations. Sponsorship available! Lightning talks are very short and often improvised presentations.